I have a heart for old things because they bring so much life and interest to a home. They have a story and a history. I like to think about how many hands have touched an old object or where it was used in its past lifetime. I especially love to use salvage to decorate! 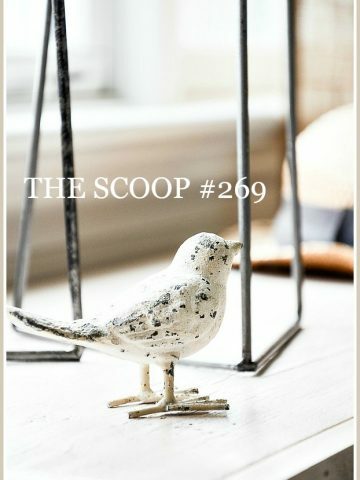 A little chippy piece from an old home or a worn piece of galvanized metal or a white dish with lines of crazing is totally charming and adds instant warmth to a room. And salvage is white hot right now! 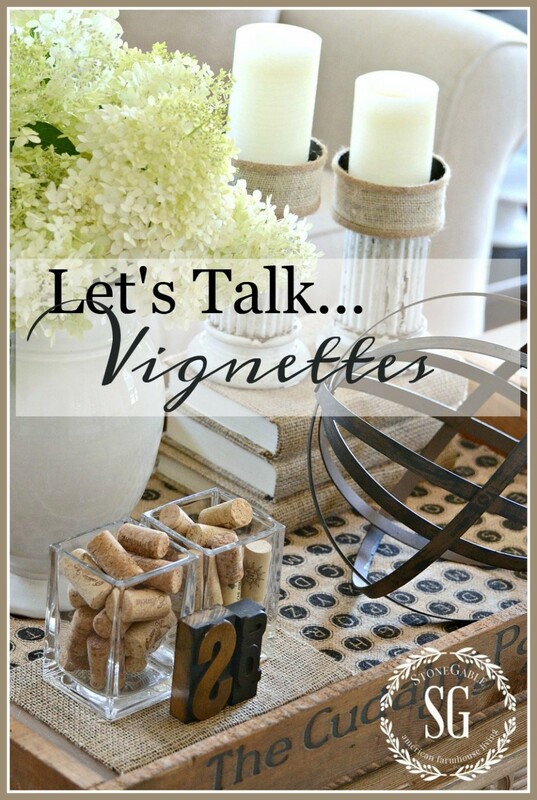 Today let’s talk about how to use salvage in your decor! 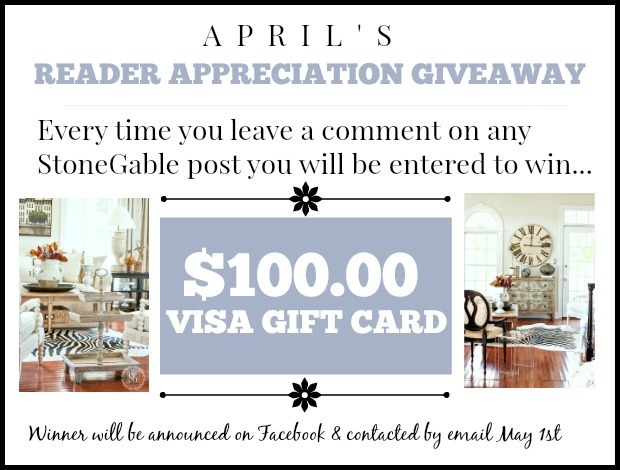 Make sure you enter the GIVEAWAY at the end of this post! 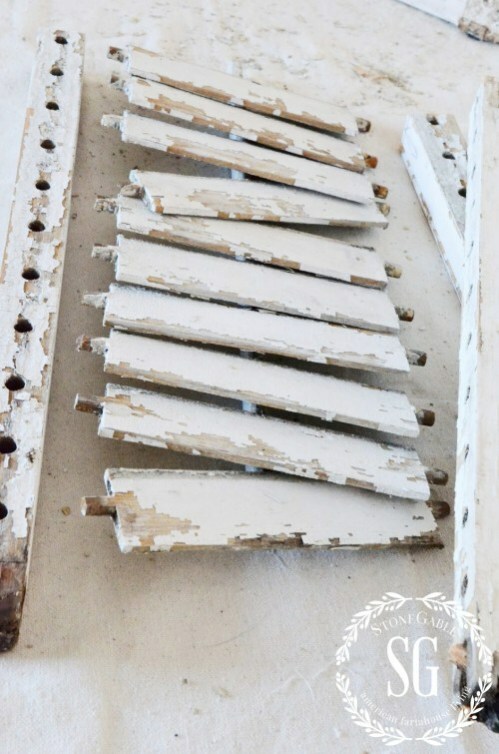 Today on our podcast DECORATING TIPS AND TRICKS we are talking about SALVAGE too! Anita, Kelly and I all love and use Salvage items in our home and garden. When I think of salvage I think of things of a time-gone-by era that come from old homes and barns that might have ended up in a landfill. But now they are valued for their patina and worn paint and chippy layers and tarnished aging. These things are rescued and repurposed in creative ways to give our homes a one of a kind look. Every home needs a little upcycled salvage in their decor! Salvage can actually make a room quite elegant! Salvage pieces are so so popular right now. 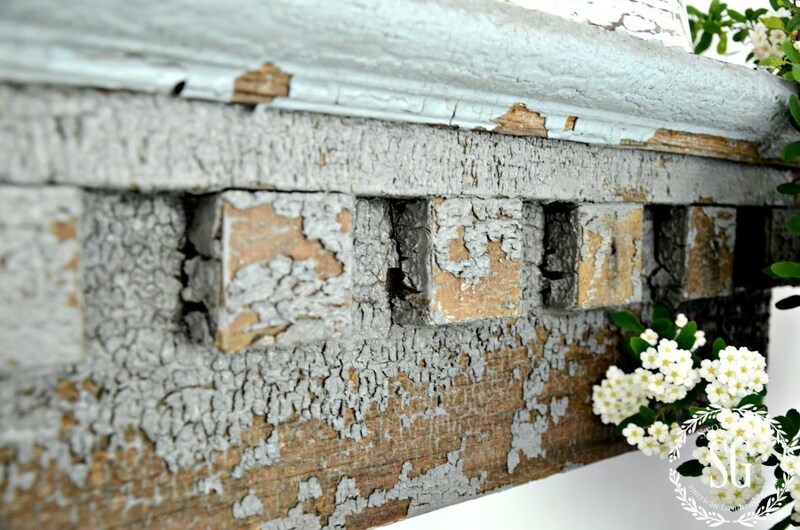 Think molding from an old home, corbels, old galvanized farm items, and more! Almost any room can handle a little bit of the salvage beauty! Just a piece or two. We want it to be a little surprise element in a room and not make a room look like a vintage store! See how to resize shutters to a smaller size HERE. Most of us love the look of salvage but think, “How can I use it in my home?”. That’s a great question to ask. Corbels become book ends, thick moldings become shelves, spindles become risers, chicken feeders become planters, columns are cut and become table legs and small pieces of door moldings are made into unique art! If you find a piece and love it, get it and live with it in your home! 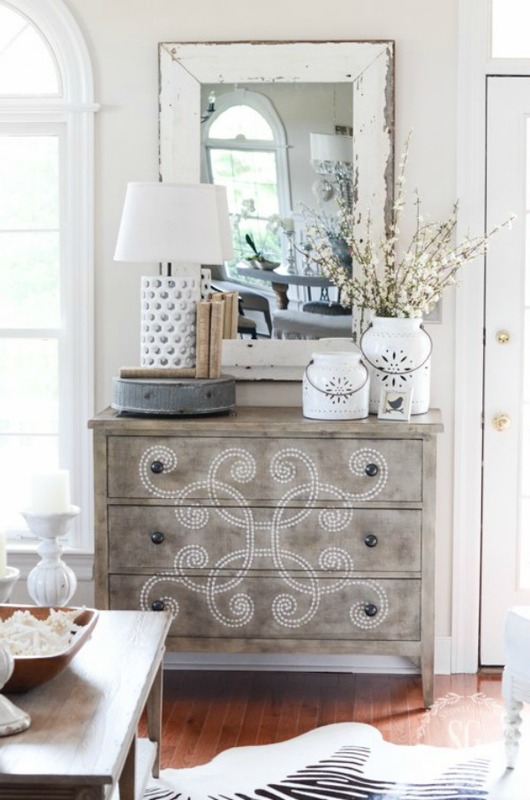 And here’s a fabulous thing about salvage… it is inexpensive!!!! Look at the chippy beauty below. This is worth its weight in gold!!!!! See this beautiful architectural shelf in my guest bedroom HERE. How cute is this? On a day hiking trip on the Appalachian trail my son Christopher popped the question on an antique window that was turned into a sign! He and this salvaged window stole chippy-loving, vintage Abby’s heart! This salvage window hangs in their dining room. If you listen to today’s podcast on salvage you will hear a story about Bobby and one of his first encounters with salvage in our home. He started to get a little over zealous trying to clean it up! Salvage should be lightly cleaned but I think the dust in its cracks and crevices are part of the beauty! A light cleaning is really what most salvage things need. Just remember “One person’s crud is another is another person’s patina”. A wise tip from Kelly at My Soulful Home! I love that! If the idea of a little dust of ages or fly dirt grosses you out you can always seal a piece of salvage. Just spray several coats of matt sealer, or polyurethane on your piece and that should work. Obviously, you do not want anyone to eat any chips that come off old painted pieces! 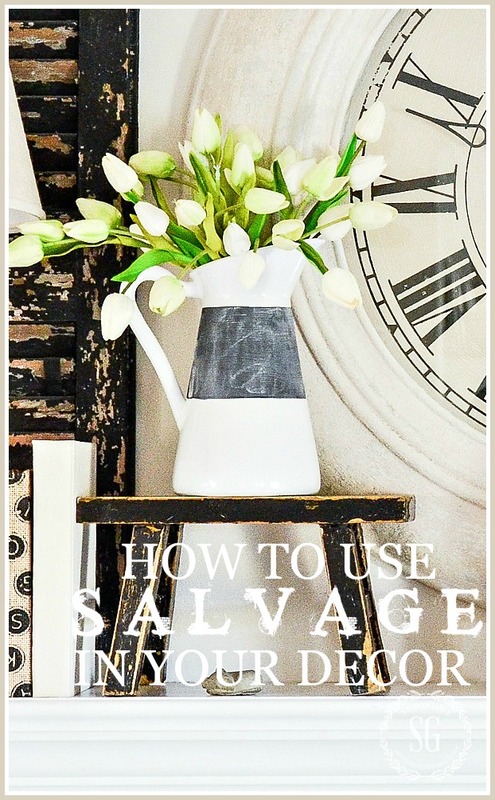 If you are a clean freak or a perfectionist you might need to warm up to using salvage in your home! But it’s so worth at least trying one piece! The beauty is a look that is one-of-a-kind! All the dirt, grunge, dust, fly dirt, smudges and schmootzy we scrub out of our home now is treasured on a piece of salvage! One of my favorite ways to use salvage is to create art with them! 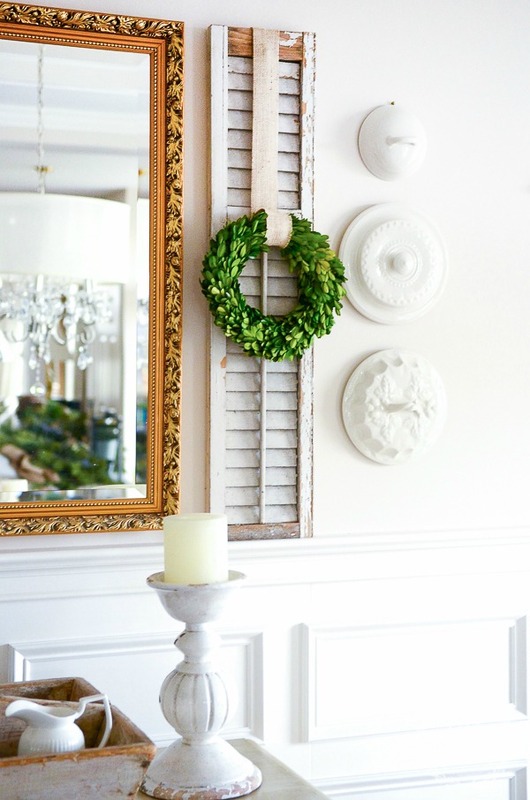 Hang shutters on a wall or make frames from old pieces of wood. 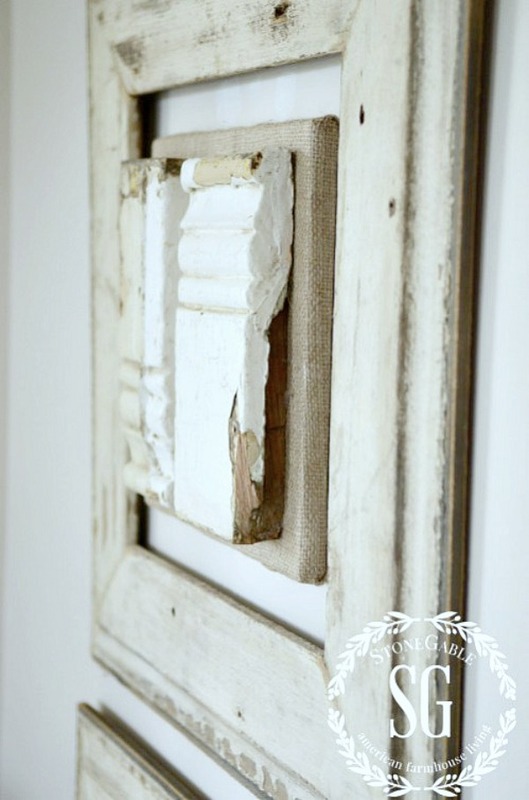 Or try your hand at mounting a piece of architectural molding to a canvas! Art… and it’s an original! If you like the look, warmth, and charm of using salvage in your home but are not sure you like the “grunge” try reproducing some salvage yourself. Paint something that has a very time-worn look! It’s so much easier than you think. I recommend any of Amy Howard At Home You Tube videos. Amy is a master at creating very authentic looking pieces that look like they might have been found in one of the best museums in the world or in salvage heap! I made the three Venitian Mirrors for my foyer using plastic ceiling medallions from a local hardware store. Of course I used Amy’s chalk-type paint and her instructions! Who knew that I didn’t spend $$$ on them? 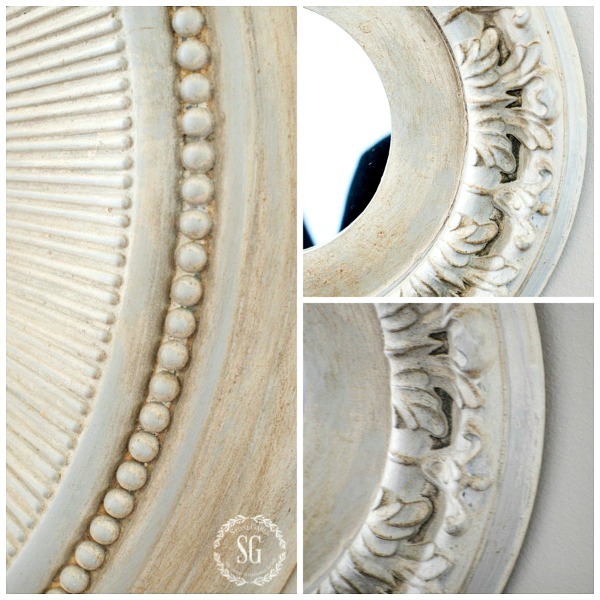 See the PAINTED MEDALLION MIRROR DIY HERE! Also, think about creating a gorgeous salvage patina on a piece you already have. The ultimate upcycling! You can see how I upcycled my mantel clock HERE. BEST PLACES TO FIND SALVAGE? Salvage is probably not too far away from where you live. Because it’s so popular right now many vintage and antique shops are carrying lots of things like old doors, shutters, windows and more! And make sure to find trendy salvage warehouse that are also popping up all over! I hope you are enjoying the salvage craze that’s so big right now and bringing it home!!!! Make sure to go to MY SOULFUL HOME and enter to win a trio of beautiful rusty fence post points. Leave the review and tell me in a comment here what your iTunes name is so I can see it and enter you. Leaving a comment also let’s me reach you if you are one of the 3 winners. All three are a little different! So beautiful!!!! Go to Kelly’s POST for the details! Is there a place online where you can get a pretty good deal on chairs? Thank you! Also, I absolutely love your Facebook page. Hi Geneva, I like Wayfair, Birch Lane and Hayneedle for chairs. They are all online sources. Hope this helps. I love how you can take the most simplest things and turn them into beautiful ges. I am so in love with architectural salvage and there are several pieces I want but around here it is not cheap. You would think being scrap it would be but sellers know it’s a hot commodity so they’re asking and getting top dollar for it. I can look at pictures of your home all day. I fell in love with your corbel the very first time I saw it on your blog. After that I was determined to find one for my mantel! It took a while, but I did find TWO beautiful corbels on E-bay. They are from the porch of a farmhouse built in the 1800’s in upstate New York. The house itself was huge ( 5000 sq. feet!) I can imagine the salvage this house provided! One thing though, Yvonne, I have to take issue with your statement that salvage can be found fairly inexpensive. Today, this is no longer true. Prices are up, and if you are looking for a nice piece, expect to pay. I’m not complaining because I LOVE my white, chippy corbels with vine patterns carved into them! I think the day of buying inexpensively is past. These beautiful pieces are in such demand, they come with a price. Just goes to show you! Loving it all for less! 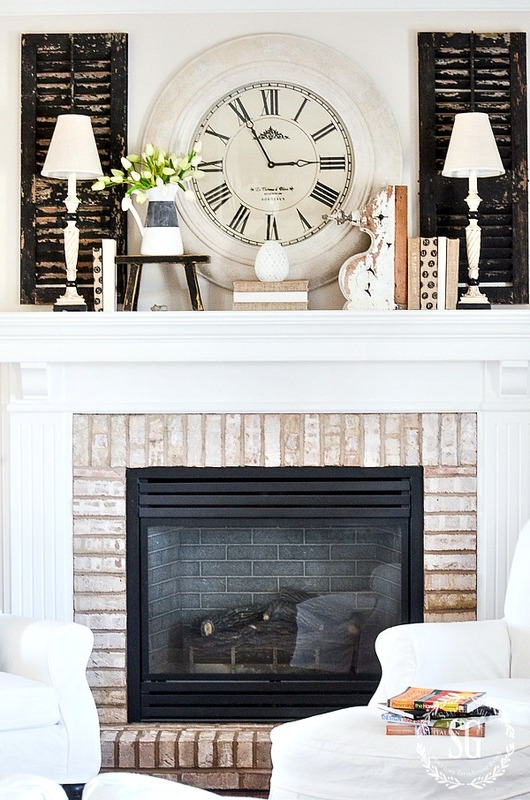 Did you whitewash the brick on your fireplace? I am thinking about doing it to my brick but it is floor to ceiling because that’s a lot of brick! Ant advice on whitewashing? Love the look of adding a few items that are distressed or chippy .. for me a little goes a long way. You make everything look fabulous!! This is amazing! Great ideas to use salvage pieces! I enjoy mixing a bit of salvage in my décor too. I don’t always favor the super chippy stuff, but love old things. I recently received my Dad’s old brush that he used on his drafting table to sweep off eraser dust. I have such fond memories of him sitting at his drafting table drawing plans and using the brush. He passed away a couple years ago and we found the brush along with some other desk items in a shed on his property. I completely geeked out over the items and am so thankful I have them now. Since he was an architect who strove to keep old houses intact, I do love architectural salvage and have a few pieces in our home. Thanks for the great inspiration! I do love the salvaged look, but struggle to make it fit into my home. Somehow I always feel like I’ve just made my house look more like a garage sale…even with just an item or two. But I will keep trying, and you’ve given me some great ideas! Kathleen, start with just one thing! Absolutely love the OLD & chippy mixed with the traditional in our home. My hubby doesn’t LOVE the OLD & chippy but I still LOVE him and he is OLD & chippy! Have a great week Yvonne. Loved the architectural element in a picture frame, Thank you for the great idea. Edit amount of salvage you use is great advice. A little provides a nice wabi Sabi contrast…too much makes a room look tired. I am inspired to give this concept a try! I am a bit of a perfectionist and matchy matchy gal! You have a keen eye for blending old and new! This is some NEET ideas..love the look ! Love your blog, I look forward to reading it everyday with my morning cup of tea. I love using architectural pieces in my home, but the hard part is finding them. I live in sunny Southern California and if you are lucky enough to find a good piece, it is very pricey. I recently bought an extremely chippy section of a front porch railing, maybe 3 1/2 feet long with about 10 spindles for almost 200 dollars, but I loved it and had to have it. However, it tested positive for lead paint, so it has become an expensive mistake, my husband doesn’t want it in our home. Lol. They say lead paint is most harmful to older people and small children and I have two little granddaughters that I care for. I have researched about sealing the piece but nothing has made me feel comfortable enough. I see so many pieces in so many homes and wonder if we are creating a future health hazard or am I just overacting? I frequently go to flea markets, but we are so limited here, salvage yards are few and far between. Guess we need to plan a vacation just to go hunt for fun salvaged pieces. Thank you for your blog, you inspire me!! I know lead paint can be quite a hazard. I seal it with a spray sealer. Old laundry advertisements from wooden boxes hang in my laundry room. Certainly gives it a look that I like next to the modern appliances. I just love all of this. I am a decorator and I love to repurpose salvage pieces. I love all of your blogs. Keep it up. I love the salvage items used in your decorating. I’m trying to find some shutters for my home and have been checking out salvage stores near me. LUV salvage !! Are those white lids you have hung on the wall in your room ?? ‘salvage’ I zoomed in and WoW !! FUN idea. GREAT idea for use of ‘salvaged’ shutters !! Thank you so much for all the tips! I love od things and will incorporate them into my decorating! Love the shutters! arch that mimics the window. I love salvage pieces in décor. I feel there’s such a story and history behind the pieces. Thanks for the post. 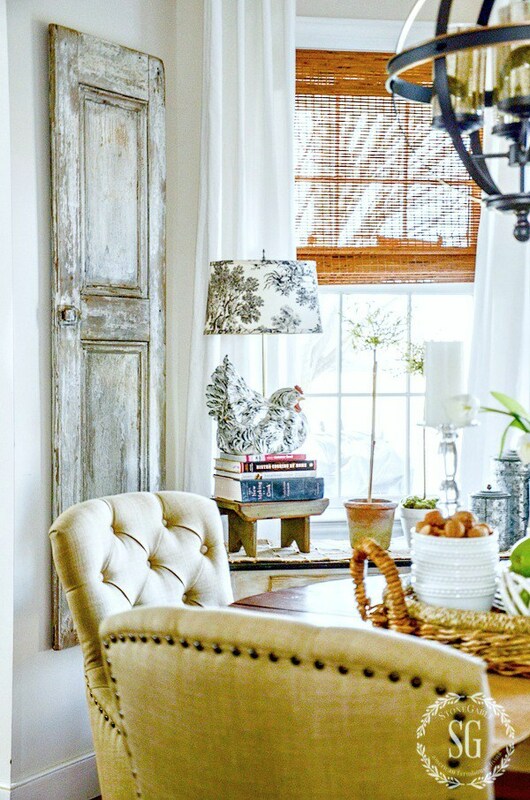 Great ideas for using salvage pieces in our homes. I love how your son proposed! Everything you do is so inspiring. Wish I were able to find half the salvage items you do. It is all so beautiful and inspires me. Thank you! I like how you have used salvage in your home. You really make it work! I love old salvaged thing mixed in with newer things. I have always loved old pieces with rust or flaking paint. The trend now has finally caught up. You use salvage in wonderful ways. love salvaging!!! like to re-use extra pieces from projects we do in our house ,they mean a lot. I am also collector of use items. They are so fun to decorate. I took old little red wagon and put plants in it for the side of the garage. I love it. Spray paint is my best friends. Thanks for all the ideas you have given us. beautiful things! you do know there is a ‘crackle paste’….that ‘helps things along’ a little more. I do old windows, just in spots where they need it, and then seal it. Makes it uneven, but sometimes just what it needs. thank you. Loved the podcast, Yvonne. Thanks for sharing these tips and the beautiful pics and links, too! I’m always on the look out for these old worn pieces! But making them fit into my decor can be alittle frustrating. Maybe I haven’t found the right piece! Thanks Yvvonne! Great post! I’m in love with your suggestions and ways to incorporate vintage into your decor! I`ve used salvage pieces in my home and yard all my married life. Galvanized buckets and washtubs from both sets of grandparents, enamel dish pans, old pottery pitchers and crocks, crates. Love it all. I love the post and the salvage marriage proposal!! I so love the audio! Thanks for,adding this! 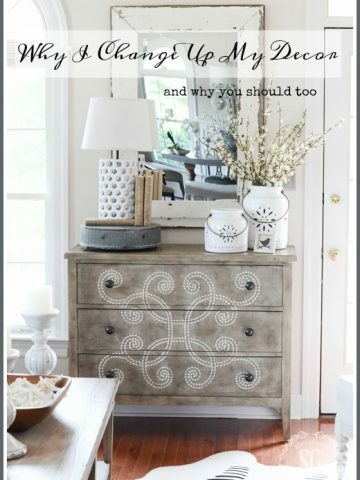 Loved reading this post about your “salvaged” pieces as well as how beautifully you have managed to repurpose and display them in your home. Right now I am into anything galvanized to plant flowers in outside or display inside my home. I’m trying to embrace chippy and salvage. So far I only have an old window I my guest room and an antique tobacco basket. Maybe in time…. You make it look so natural. Precious art in my book. I loved this post. The older I get, the more I appreciate the craftsmanship of the past. 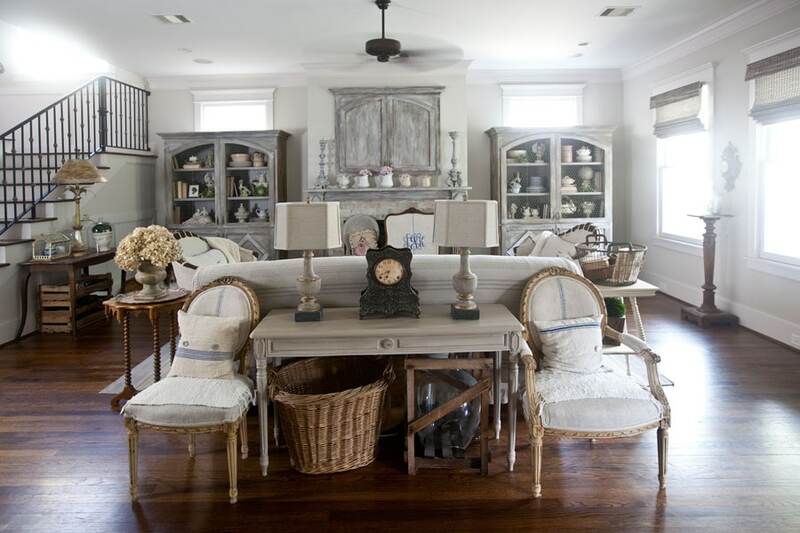 Your home is a beautiful example of living with salvage pieces scattered throughout. I just finished re-decorating a bedroom. I have my parents antique furniture so that remains the same finish. But, I had collected a large mirror frame which I put on the wall with a chair shelf inside of the frame. One the shelf I placed one blue-green quart jar with white beans in it with one candle. On the pie safe I placed a antique watering can, a old bicycle wheel, and a blue-green jug and three smaller silver creamers all on a antique lace cloth. The bed corners in the room and behind the bed I have a table with shutters, a large silver tray and a large green glass candleholder. On the dresser I used a pretty wrought iron candleholder with mercury glass holders on it. I love salvage items and pick them up every time I can find them. Thanks for this article!! Love Stonegable!!! Awww….It’s wonderful. I never thought that salvaged items could look this much beautiful. It’s simply lovely. I just loved this post. 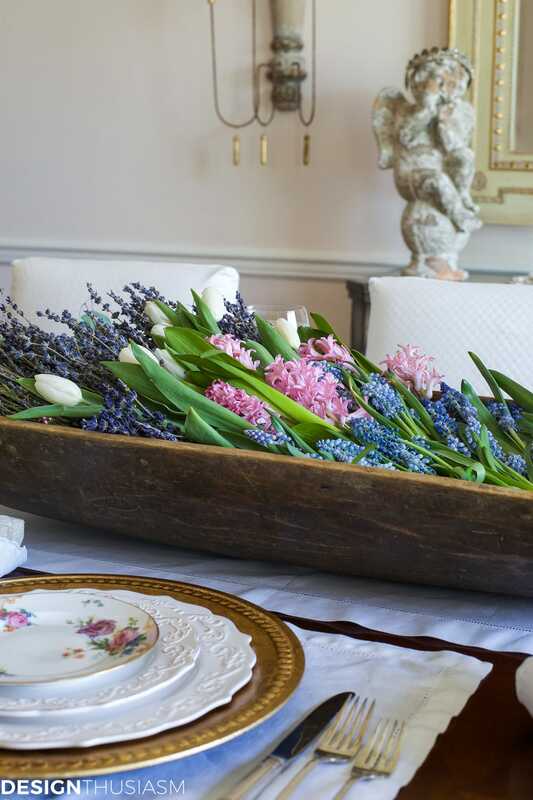 Yvonne – Love, love, love this article on using salvage pieces. I’ve collected and antiqued since I was 14 years old, going to auctions, thrift stores, antique shops and, yes, picking curbside. Some of my favorite finds are someone else’s cast offs! Way, way back then we called it “Early Marriage.” It was what we could afford at the time and we made do by re-doing pieces. Now it’s hip and called “re-purposed.” Ha! 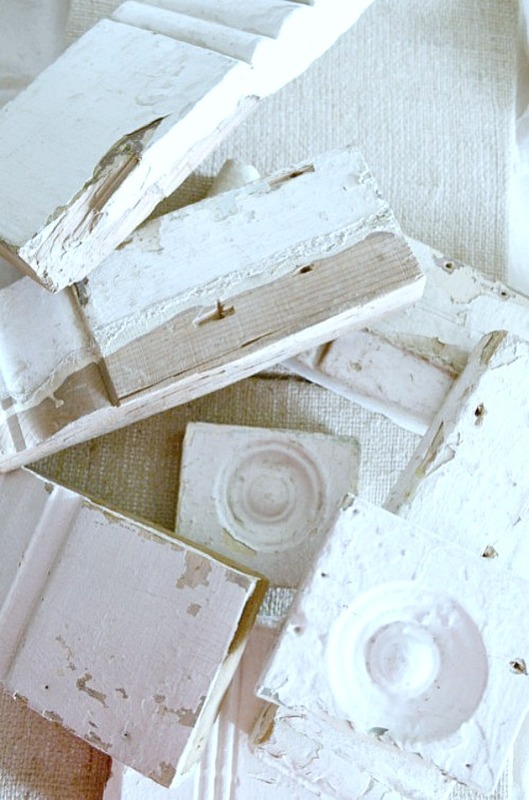 so much for repackaging “used!” You offer such great tips on incorporating salvage into a home’s décor. Thank you for the ideas and inspiration! 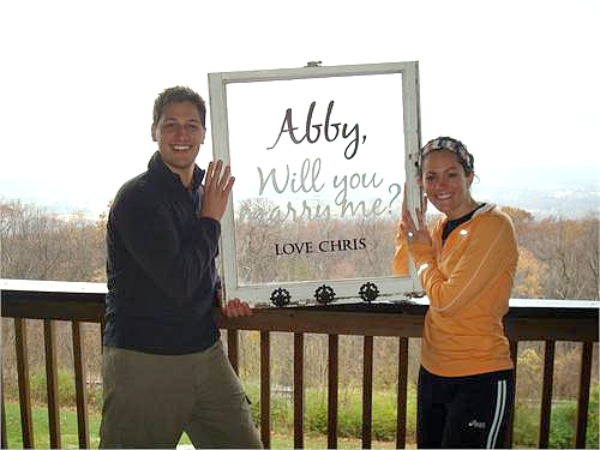 I love your son’sproposal window, that is just so sweet! I’ve got a couple old windows waiting for my attention this Spring!! I love re-purposing old things and I like chippy too! Thank you for using your influence on the bog to spread the news about salvaged items. I am lucky to have my husband’s carpenter tool box from his younger days on my desk as a planter! StoneGable. I just replaced the poinsettias purchased on Dec 2 with baby boxwoods for a new, carefree summer look. Thanks, Nancy, for sharing this neat idea! I love salvage pieces in a home. Wish I had more. And I love that cute proposal! Great idea. ? Love salvage pieces and have a few from my grandmother’s farm. 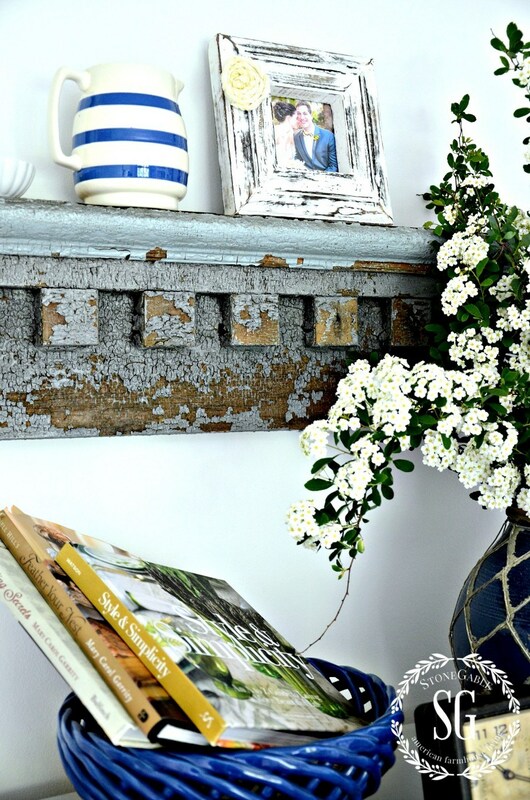 I just love that chippy blue shelf….so gorgeous and what stories it could tell! As always much information and wonderful ideas! I love the medallion mirrors, but I couldn’t get the “here” button to take me to that post! I love those medallions and have made some and given them to my children with their family pictures in the center! Thanks for all your wonderful tips and for your continuous stream of ideas! 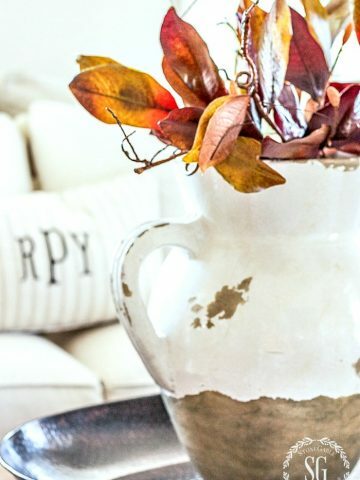 Salvage on the burlap canvas is an awesome idea. Always the best Yvonne! Love this style, chipped paint, old wood, mixed in with newer things and I feel right at home. Glad I found your site, needed help with the vision. Love your post today! Love, love, love the OLD junk (oops! SALVAGE) mixed into traditional decor. 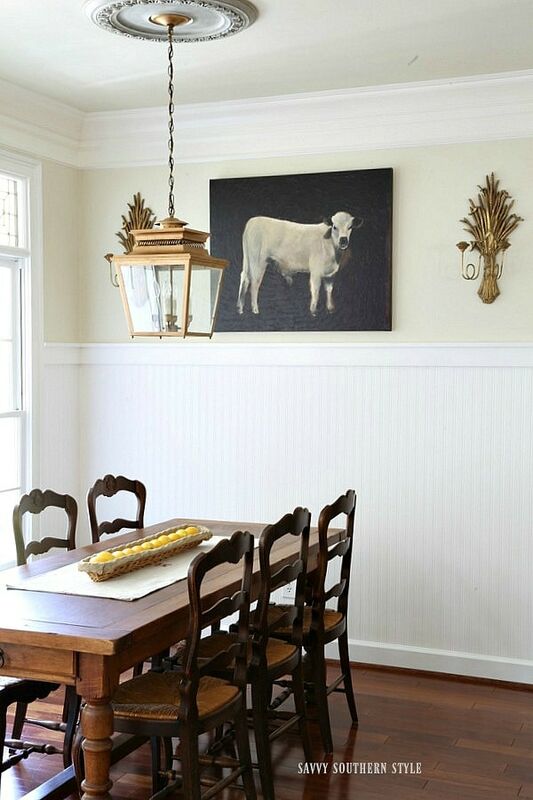 Your salvage wood on canvas is one of my favorite DIY’s of yours. Great blog post! 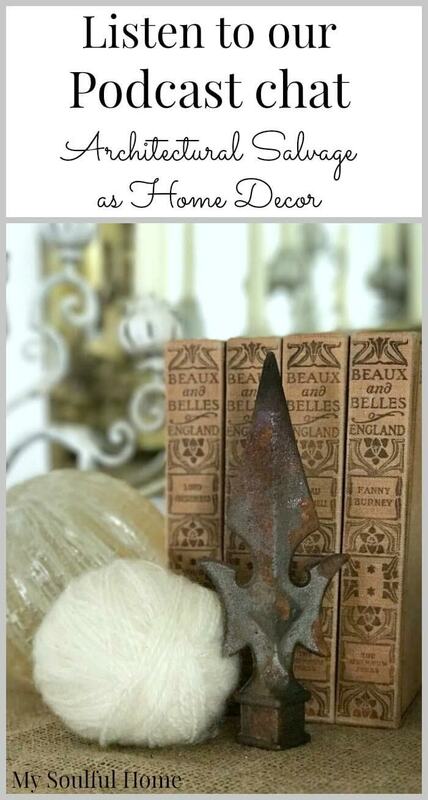 I love using salvage in my decorating Love your blog! I have a friend that does salvage and I buy many of her things. I believe I may start trying for myself. This posting is super useful! Thank you for encouraging us to look at the beauty of days gone by. I got a couple of salvage pieces that I got them at “State Sale”. Thank you for the ideas and the pictures showing how you add them to your decor. I love salvage! I have added a set of small shutters to our mantle. You inspired me with yours! I have a couple other shutters and chippy white painted architectural pieces placed throughout our home. Just enough to add interest. The best is a pair of shutters in original green paint with an “L” cutout . These are perfect as our last name starts with the letter L.
I have placed them in front of the sidelight windows at our front door entrance. They really make a statement as they welcome visitors to our home. I do like unusual salvage. But to a couple friends they are mortified!! It appears to be junk!! That’s okay. I may decide to discard it too. But for now it fits a certain spot and my color scheme perfectly!! Mine was from an old local school and is a cast for something for art yet is mounted onto large chippy wood. It’s truly unique and adds a pop of color and total wonder!! I still can’t quite figure them out!! The smaller looks like a bird on a thick perch but I have no clue what these truly could be used for in an art class!!! I have chippy frames too. I did not know about lead so I did spray all with clear matte spray paint. Several coats. And I look up right now at my salvage art and wonder, What were you doing at school so long ago?! Great tips! Although my aesthetic has moved more away from farmhouse, I cannot help but love a good patina..or some chippy-ness. It just adds so much interest and character. I am having a fit over that architectural shelf of yours…gorgeous! I love old chippy pieces but only use them on my porch and in the yard. They don’t fit in with my decor. I do have some antiques but they are in good shape. Another well written post for those wanting to introduce old chippy pieces to their decor. such pretty salvage pieces! it is amazing what can be done! LOL! I listened to your podcast this morning and had to laugh! We have build a new home and my husband has wanted to use some old barn siding he has been storing for YEARS to cover a wall in his “lodge area” (I don’t want a CAVE in my house!). I kept putting him off until we built this new home. I have to admit, Yvonne, it looks fantastic! I haven’t done a post on it but will soon. We only did one large wall and another smaller wall where his bar will be but we are so pleased with how it’s turned out! ‘Salvage’ definitely works in decor! This is also extra special as this old barn was built by his great grandfather on the farm where we now live. Wow, how nice to use salvage that connects you to your relatives. So special! farmhouse. I used to think that all that chippy, old stuff was…well…yucky. I thought that they were crazy people. Now I am one. I just love old architectural pieces!!! Nice post, Yvonne. I am a much too much a neat and clean freak so I don’t do too much distress- just enough for trendy, but too much makes me uncomfortable. I love to see it in others places but for me it’s too much. I really enjoy what you’ve done with your wonderful salvage pieces! Congrats to your son Christopher – boy they are a CUTE COUPLE! What a neat idea using that old window! BTW- my brother for his own college graduation present to himself walked the ENTIRE Appalachian Trail – all 2000 miles Georgia to Maine!It took him over 6 months to do it, too! Congrats to your brother. What an accomplishment! Christopher has hiked part of it. He loves it! It is amazing what we can “make do” just like our grandmothers used to do… not because we have to but because we can. Hugs. 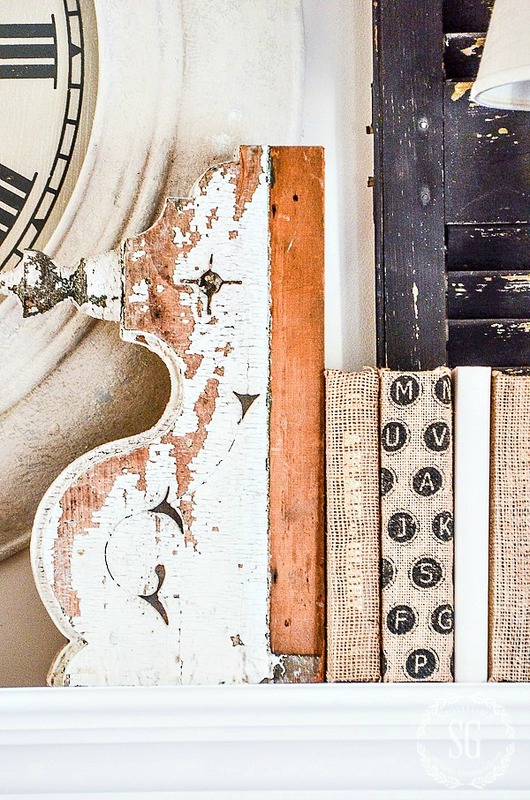 I love a few salvaged pieces as accents in a home. I’m glad to put something to use as unique decor instead of sending it to a landfill. Very nice post – I would more than likely pull a “Bobby” and clean it up too much. Thanks for the ideas. I love salvage too, but the lead paint issue is one that must be taken seriously, especially with young toddlers or children who chew or put hands in their mouth. The fact is, the older the item, the more likely that lovely “chippy” paint look is actual lead based paint. Sealing the item with several coats of satin varnish or urethane is the only way to protect young children. I love these items, but waited until my child was older before bringing them out to display. I keep mine where they cannot be touched. Way up high and the other pieces are hung high on a. Wall. As extra precaution I did do as advised where I got. The pieces. I sprayed three or four light coats of clear poly spray paint in a matte finish on both fronts and backs of my salvaged “art”. I also do not move it often. Lead paint, I looked up, is not harmful if I do not disturb it. The poly coat keeps any of the chippy look from falling off yet I cannot tell it has been painted with a sealant! Hope this helps Joan!! All great reminders and tips! I love salvage pieces too. In fact, I have a piece of architectural molding from my childhood home and didn’t know how to display it. I’m going to copy your idea of putting it on a burlap canvas – very cute! Thanks for the inspiration. After living across the street from a dear friend whose mantra is “never let a piece of salvage go uncollected”, I’m right there with you on on EDITING.! I really think the hunt is almost as good as the finding–I’m off to Roundtop, TX this weekend to find the perfect piece for my front porch. I am soooooo jealous in a good way. Roundtop is on my bucket list! Even though I have a love for old and typically not refinished, I do struggle with salvage. Love repurposing items but this is a little different. I really appreciate your perspective and will rethink where to use it in my home! Awesome! LOVE your open mind for decor, Karen! I love the look of salvage pieces too and have used them in my decorating. I agree that like anything too much can look overdone. It’s always fun to shop for and find something vintage that is just perfect! I keep looking at the large clock on my wall wondering how I could update it. I’m following your directions. It looks great! Ohhhh, that beautiful duck egg blue shelf! Wow. The color really is beautiful! I am in love with wire and metal products – wire baskets ( old gym baskets, paper trays; dish drainers- anything!) All still very useful and pretty holding seasonal displays; books/ magazines; CD’s DVDs, etc!! 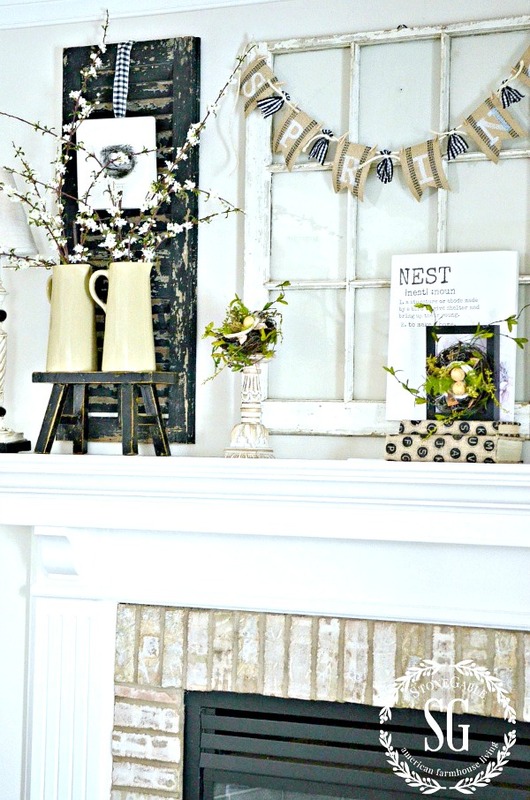 Love the corbels on your mantel – I want a set of these! Struggling with bringing items into my home that can’t be thoroughly cleaned – can embrace the idea of using it for outside decor. That’s a great place to use them Patricia! I love the look of distressed, chippy, weathered and time-worn … not on everything but a little bit here and there is wonderful! You always have the best tips, you certainly do inspire me to try new things. Thanks, may you have a great Monday. There’s a few salvage pieces I really want I just need to find the stores in my area that actually sell this kind of stuff. I love this post, Yvonne! Thanks for all the great tips. One of my favorite things is hunting for unique pieces, either at shops or even in an old barn or shed. Its so true that trash to one is a treasure to another! Instant ‘one of a kind’ charm! I’m loving the farmhouse style that has finally given me the answer to mixing old and new in my home. I never get tired of changing things up….so fun! Love all of your ideas. Absolutely Beautiful! I love your ideas! I also like how you mix glam with salvage. Beautiful! I love using salvage pieces mixed in with the rest of my decor. Do you have any concerns that the “chippy” paint might be lead based??? Hi Vi, that is why I sealed it. What sealer did you use? Did you have to scrape some of the loose paint chips before sealing it? I have this very lovely and chippy (some loose) blue green shutter from a 100 yr old farmhouse that I haven’t touched since it tested + for lead. This all just too new and unfamiliar to me. I adore your home and your use of salvage in it! I am falling in love with vintage/salvage just recently and I’m losing sleep over it. It’s making my heart pitter patter. My husband thinks I’m nuts! Good morning, Yvonne. Loved this post on salvage! I have been a lover of old things all my life, and recently have been purchasing a few salvage items here and there. I was inspired to buy two lovely, wooden corbels after I admired yours on Stone Gable’s mantel. 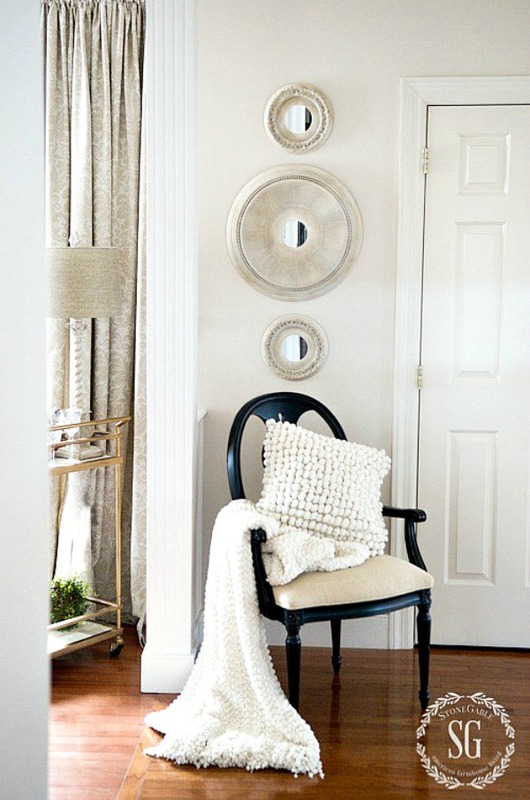 I have also purchased a beautiful, farmhouse mirror, which will hang in my living room. I totally agree with you that salvage brings a very unique look to one’s home. I do want to add that salvage is NOT reasonable. Here in the Midwest, dealers have caught on to how popular it is, and prices are up. Expect to pay for what you love. I purchased my mirror for $182, the corbels were$200. Right now, I am looking at purchasing a salvaged library file cabinet which will need work. The dealer here in the Midwest is asking $600. I haven’t made up my mind yet! It is oak wood, has 27 nice-sized drawers, is 75 1/2 inches tall, and 36 inches wide. It was part of a set, so will need finishing on the sides, due from being broken apart from a set of six. Most folks today are aware of the worth of old items, and “pickers” have already been out and about, gathering up the cheap stuff. I just want your readers to be aware that prices are up, and I believe they will continue to rise. So I guess one way to look at salvage when you purchase it is, today’s price is cheaper than tomorrow’s! Love the use of salvaged items. Much better than the land fills! This post lead me to the chippy shelf post in your sons room which lead me to the post about your daughters old room -I loved the story it was one of the sweetest things I’ve read on a decor blog so beautifully written -if you are a reader and have not read that post please find it and read it it’s simply lovely. Thanks for the salvage ideas. I have a hard time visualizing the product in my home. I do love corbels and using them as book ends looks interesting . 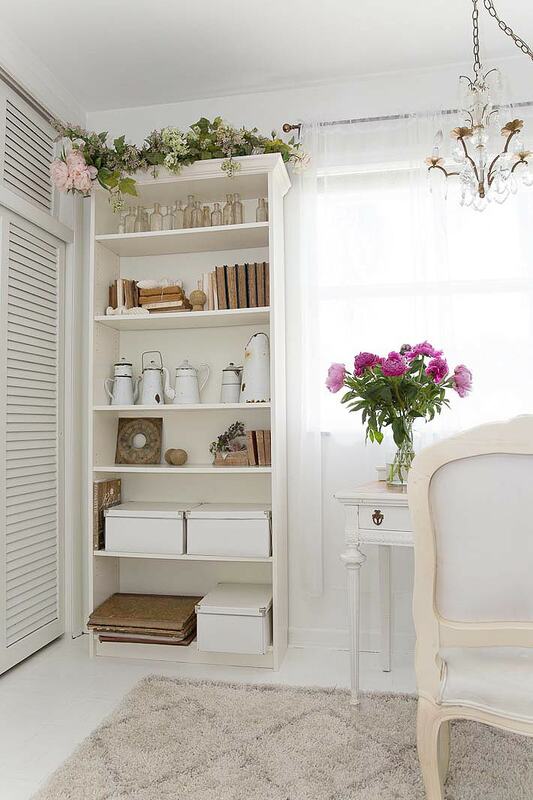 I love the look and it adds instant charm to any space. Your shelf in your guest bedroom is a favorite, and a corbel or door…fabulous! Happy Monday, Yvonne! I like this look in other people’s homes but don’t think it would fit into my own style. I love finding wonderful old things. 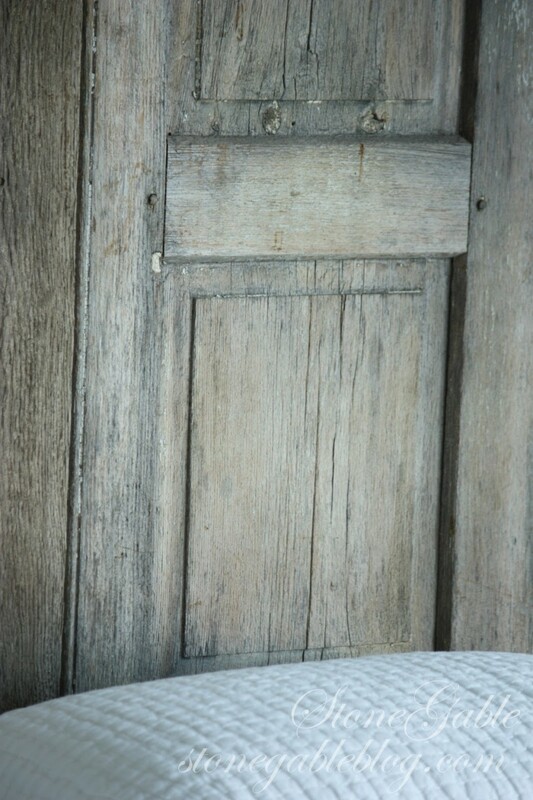 I am excited to find a couple of wonderful aged doors for my home at some point. Thanks for the tips. Salvage makes my heart beat faster but I agree it must be edited. So hard to do when it is a favorite find! Great post, Yvonne. About 15 years ago when I became disabled and had to take early retirement I supported myself in finding many kinds of small salvaged items, painting them and decorating some with florals, making shabby and primitive signs, etc., which I sold on eBay and later my website. I still have a heart for old things that were made by hand and not mass produced. It simply gets into your blood!